String bags and mesh shopping bags are popping up everywhere, which probably feels like déjà vu for people who grew up in a time or place where they were the norm. For those who enjoy the occasional nugget of history, you might be surprised to know that Wikipedia actually has an entire (albeit brief) page devoted to string bags. Well, if that doesn’t thrill you, I don’t know what will. I love reusable bags for shopping, and wanted to create my own design with more heft to it as well as a pop of color. The Color Block Market Bag is one step up from a string bag — a little stronger and a little more stylish. An additional bonus? My market bag is made from 100% cotton yarn, so no worries about synthetic fibers ending up in the ocean. It’s washable, durable, and not made from petroleum products! This bright, contemporary-but-classic market bag is great for trips to the farmers’ market, the beach, the library, or for a sunny downtown stroll! Constructed with sturdy worsted-weight cotton, it uses basic chains and double crochet stitches to form a simple square mesh pattern. 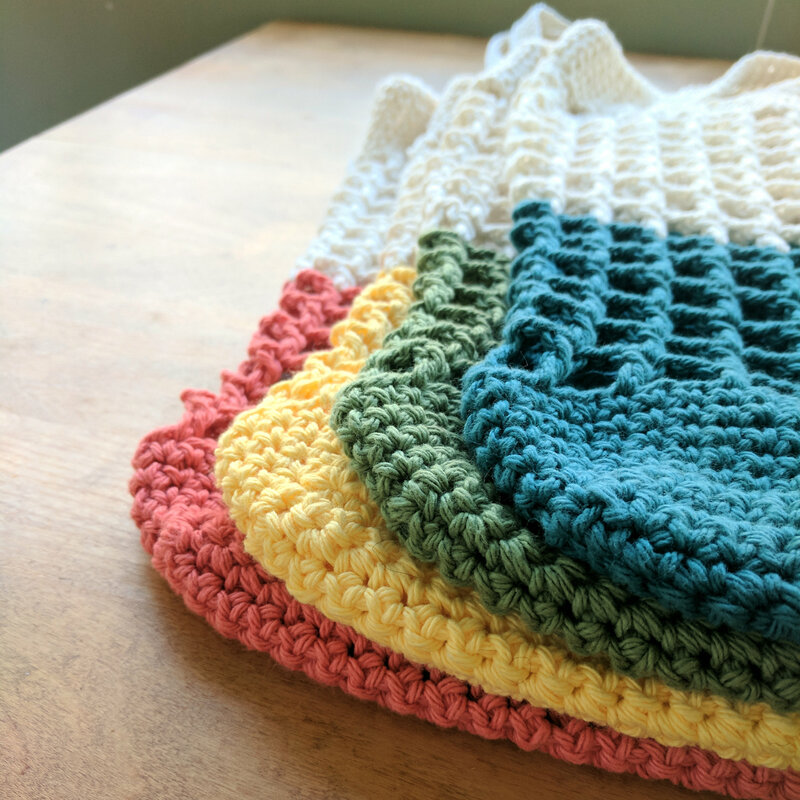 The solid single crochet bottom creates a sturdy base, and the straps can be altered to the crocheter’s preferred length. As always, please contact me via Ravelry if you ever have questions about the pattern! Using preferred color for the bottom of the bag, ch 45. Rows 3-13: Repeat instructions from Row 2. Do not turn after completing Row 13. Subsequent rows will be worked in the round. Switch colors roughly halfway through the mesh section of the bag, or wherever desired. To switch colors seamlessly, wait until you have almost completed a mesh row, but instead of slip stitching into the previous row’s starting chain with your current yarn color, pull a loop of the new color through the 3rd ch to form a slip stitch. Continue with pattern as written. Tie ends of new and old yarn colors together. Rnds 20-32: Ch 5, sk 2 sts, dc in next st. *Ch 2, sk 2 sts, dc in next st* around. Ch 2, sl st into 3rd ch of previous round. Rnds 27-28: Ch 1, sk next st, sc in all sts around. Using a tapestry needle, weave in all ends. Pattern written in 2017 by Jenn Fox for Mushrump.com. This pattern may not be reproduced or copied without written permission of the author. Hello Jeannette – I’m going to take a peek at the pattern and see what might be up. I’ll get back to you by the end of today! Hi again, Jeannette — I’ve created a diagram of the base rectangle for the bag, which will hopefully be helpful! It’s now up on the pattern page on the blog. Perhaps it will illuminate a problem or lack of clarity in the instructions that I’ve missed. If you’ve ended up with only 67 stitches, I’m wondering if you don’t have 13 rows of sc for the bottom rectangle yet, or if you aren’t working in the round. Once you have 13 rows (with 44 sc in each row), you’ll start working in the round and put 12 sc into the sides of those rows (you can skip one stitch on one side to give 11 stitches, which will give you the exact # of sts for the mesh section. Or you can skip one in the first row of mesh). The long edges of the rectangle will get one sc into each sc (44 on each side). This will give you a total of 111 stitches (44+12+44+11). If you’re still having trouble, please let me know! I love this mesh bag… made several for Christmas gifts this year! That’s wonderful to hear! Thank you and have a wonderful holiday.